After losing her father and years of her childhood to the war in Syria, Salli reclaims her childhood. Jordanian charity the Kindness Project supports fatherless families providing housing, accommodation and a small allowance. 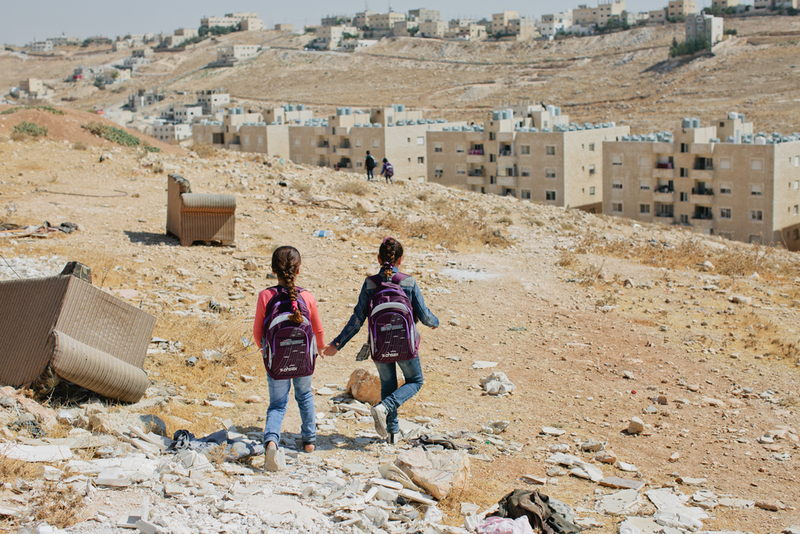 Two Syrian orphans return from school in Amman, Jordan. UN-registered urban refugees’ children may attend local schools. The government has divided the schools in two, Jordanian children attend school in the morning and Syrian children go in the afternoon. Some Syrian children are up to four years behind on their schooling. Urban Syrians like Saffa rely on the kindness of strangers, family, charities and illegal work to keep their families afloat. Saffa’s family are not registered to live in the city, therefore Saffa and her siblings can not attend schools or receive medical support. Those who aren’t registered keep their children indoors for fear of being found and forced to live in a camp. In the camps, many Syrians have made the most of their surroundings, smuggling in goods to sell and building materials to develop their living spaces. 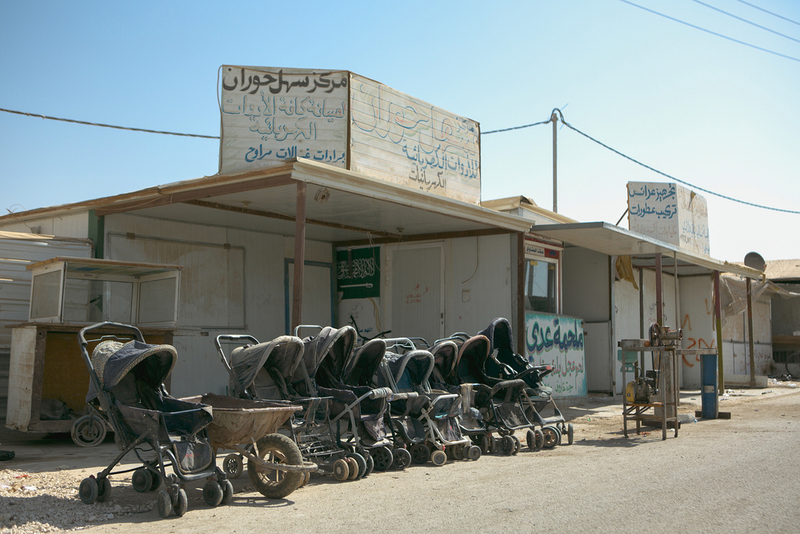 Zaatari has evolved from camping site to a bustling micro city with it’s own shopping street and economy. Zaatari has now reached maximum capacity at 80,000. Over half the residents are children. Layth arrived at Zaatari refugee camp over three years ago. Life in the desert is all he can remember. His formative childhood experiences take place within the confines of the camp with toys donated by NGOs. The UNFPA estimates that between 13-15 children are born every day in Zaatari refugee camp, with healthcare professionals attending most births. These young Syrians take a break from wheeling heavy loads around Zaatari Camp. Despite education and various activities being available to children in refugee camps, many opt to work labour jobs and help support their families rather than attend school. Children sit in the shade, play in wire surrounded playgrounds and run about in the dust. Waiting and hoping to return home. Many parents talk about heading to Europe to secure a better life for their children. There are noticeably less NGOs in Azraq refugee camp and considerably less activities. Some children attend camp school but not many. Syria had 90% school attendance before the war. As Zaatari approached maximum capacity a new camp was being developed. 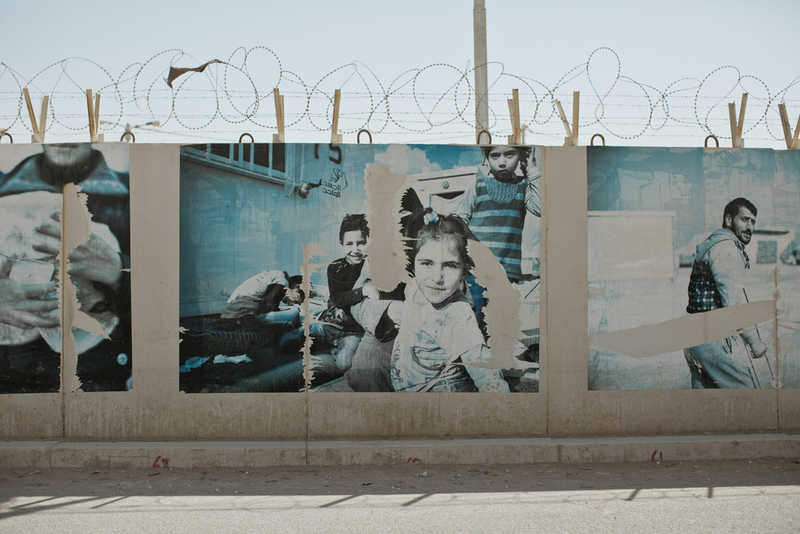 Having learnt from mistakes made during Zaatari’s chaotic evolution another camp was built. Azraq camp is an isolated and organised compound of identical caravans with capacity for 150,000 refugees and currently has approximately 30,000 residents.